Here are five tips that aim to make buying perfect tiles for your bathroom possible and as well affordable. Further, observe the tips outlined below and it could just add value to your home long term and save you both a wealth of money, time and stress. Don’t believe it? See for yourself, by giving these simple tips a read through ahead of hitting the shops. Buying online is often the best way to buy a huge range of things, including bathroom tiles as suppliers who operate via online stores cut out the need for a middle man as well as saving the overheads it costs to run their own shop. In turn, these savings get passed onto the customer. Then, ahead of hitting your local bathroom showroom or DIY store, instead check out the ranges available and the prices via a reputable online tile provider such as Tile Yard Sale, who specialise in cheap tiles. One fantastic reality about living in the digital age is that having 24/7 access to the internet places the world at our finger tips. This enables us as consumers to shops the entire globe for just about everything from food to fashion and services to subscriptions. And, as aforementioned, buying online can be a great way to save money and afford your dream tiles. That said, when it comes to buying online it is still when possible a far more savvy and sensible idea to shop form within one’s own country – and this is very much the case when buying tiles for use in any part of your home. This does not have to mean buying British made tiles; rather, and specifically it is just more sensible when possible to buy from a British based tile supplier. Tiles are heavy, fragile and created in many materials and qualities. Then, it is often far cheaper to buy tiles from a UK provider than one, for example, situated on the other side of the world. Secondly, buying from the UK massively reduces the risk of your tiles being damaged during transit. Thirdly, and finally, because shopping online involves looking at pictures of the item(s) you want to buy rather than being able to see, feel or asses the quality and actual colour of what you are buying, it is better to buy from within Britain as it is far easier usually to resolve any issues relating to the quality of the tiles you actually receive, or matters of colour discrepancies. UK sellers are, after all, situated close by and also through operating in the UK also subject to UK laws and trading standards as set out via the UK Trading Standards website. When buying new bathroom tiles and whether you opt to tile your own bathroom or pay an expert to do the job for you, there is a real chance that at least one of your tiles will get damaged during the process. Whether a tiles smashes, cracks or gets cut to the wrong size, this is likely to set you back in terms of money and time if you fail to foresee such potential issues and consequently only buy the amount of tiles you need to complete the job. Then, a tip that is likely to save you in terms of the clock and your pocket is to carefully calculate or task an expert to calculate the amount of tiles you need (and this will of course alter depending on the type and size of tile you opt to use) and then to buy 10 to 15% more than you will actually need. Not only will this safeguard you against accidental breaks and the likes, it will also mean that you have a few spare tiles should any of yours over time become damaged and need replacing. What is meant by buying style over fashion is buying the best quality tile you can afford in a timeless style rather than giving in to buying what is currently in vogue or being flashed all over the home interior magazines. A perfect bathroom related example to prove why this is a tip worth heeding is the once fashion for fitting avocado coloured bathroom suites. Extremely popular for an extremely short amount of time, once coloured bathroom suites fell from fashion bathrooms which featured them suddenly and instantly screamed ‘outdated’. Consequently, white suites that were older than coloured ones actually appeared more stylish than those that were newer and had cost their home owners to have fitted. In fact, and as reported via the This is Money website: ‘A Barclays Mortgage survey found that 62 per cent of 2,000 people surveyed said an avocado coloured bathroom suite was the biggest turn-off in a home’. 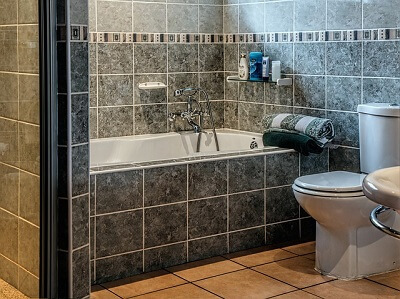 For this reason, an avocado or coloured bathroom suite can even lower the value of your home as refitting a bathroom suite is not a cheap thing to do and there is no quick fix to fixing a fashion faux pas when it comes to bathrooms. And, the same goes when choosing tiles; hence, opt to choose a neutral and inoffensive, high quality tile and add personality and colour with easily replaceable bathroom staples such as bath mats, shower curtains, soap dishes and art. Last but not least and another way of potentially making your dream bathroom tiles affordable is to simply use them to tile both your floor and bathroom walls and / or shower area. The more tiles of a single variety you buy, the less you will pay per tile. Then, home owners who choose a single tile over tiling the floor in a different tile to those used to cover the walls are likely to save a significant amount of money, and time searching for different tiles that do not clash when it comes to aesthetics.